Russian divers Ilya Zakharov and Evgeny Kuznetsov have earned an Olympic pass. 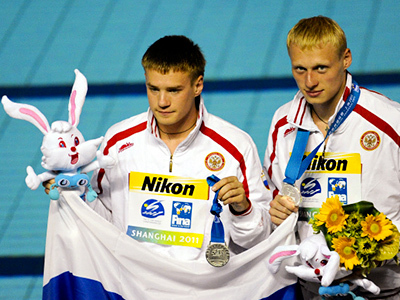 The duo grabbed a silver in the three-meter springboard in their first ever World Championship event. China’s Qin Kai and Luo Yutong dominated the final as they pulled away midway through on Tuesday and went on to win with 463.98 points. They earned the host country's second gold medal of the day and eighth medal overall in the outdoor pool. The Russians came second with 451.89 points. Mexico's Yahel Castillo and Julian Sanchez earned the bronze at 437.61. "Our rivals gave us a lot of pressure, especially for the final dive. They made a few difficult dives. However, we kept our confidence and solved the problem. I'm happy to have the chance to take part in the worlds," Qin Kai said. The Russian duo earned the third overall medal for their country. Earlier their female synchronized swimming compatriots claimed two impressive wins. Zakharov and Kuznetsov will now head to London in 2012, and the pair are sure they will be able to compete for the Olympic gold next year. “The Chinese divers are very experienced. They’ve taken part in many major competitions including the Olympics. However, we can compete with them. The only thing we need is to show our best at every single dive,” Ilya Zakharov said.